My name is Emma Sheardown, I am 27 years old and from Grantham. I was born with Cerebral Palsy, which affects the balance and co-ordination of my limbs. I am a full-time para equestrian dressage rider, based at Angela Weiss’s yard at Papplewick near Mansfield. At the moment I have one horse to compete called Purdy’s Dream, or Eddie to his friends. Eddie and I have been together since February 2008; he really is a very special chap and is great to work with and be around. Being an international para dressage rider I have an amazing life. 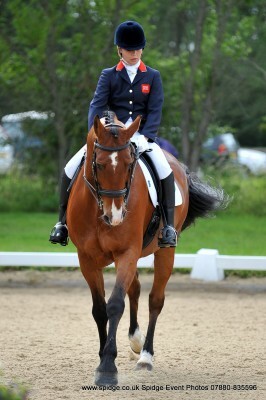 In 2004 I was selected onto the world class development squad for para dressage. The aim of the development squad is to identify riders’ talent and to nurture them along the performance pathway and on to the championship teams. Five years later in 2009, I was selected, along with Eddie to compete at my first major championship, the European Championships held in Kristiansand, Norway. This saw a turning point in my career as I came home with my first medals – gold and silver. Also in 2009 I started working at Payplan for one afternoon a week while continuing my equestrian career. As a result of my European success, in 2010 I was promoted onto the World Class Performance Squad. This was followed with a trip to Kentucky, USA, to represent Great Britain at the World Equestrian Games where I won a gold medal and a bronze medal in my two classes. This was an absolutely amazing experience, competing on the other side of the world with all the other equestrian disciplines alongside some of my childhood idols. It was a once in a lifetime experience. Despite all the highs of equestrianism it requires serious financial commitment and, since you never know what is around the corner, I decided it was time to add another string to my bow. Having dabbled with journalism throughout my dressage career, by updating my website and writing a regular feature ‘Emma’s Diary’ in Equestrian Life magazine, I decided that writing was something I really enjoyed. I also thought that maybe it could provide an income in the future. So I have enrolled at The Open Study College on a level three Freelance Journalism Course. Studying fits>around my training, as there is no fixed time limit on assignments. After working for Payplan for three years I took a break last summer to focus on my training ahead of the selections for the London 2012 Paralympic Games. I had previously worked in both sales and marketing so it seemed like a good time to see if I could find an area where I could put my journalism to good use and learn more along the way. So, when I returned to Payplan in October I moved to the public relations section of marketing. It has worked really well and I have been involved in finding good client case studies to use in the media, as well as researching and writing blogs. I’m really enjoying putting my new skills to good use and also gaining an insight into how Payplan helps people in debt.